The Monster-UI Framework has been built to allow developers to code their own apps and to allow them to reach their users via the Monster-UI. There are 2 ways to add your applications inside the database. This will load the apps (and let you know which apps it couldn't automatically load) into the master account (including icons, if present). For any apps that failed to be loaded automatically, you can follow the manual instructions below. Now click on "New Document", and we'll create that document. 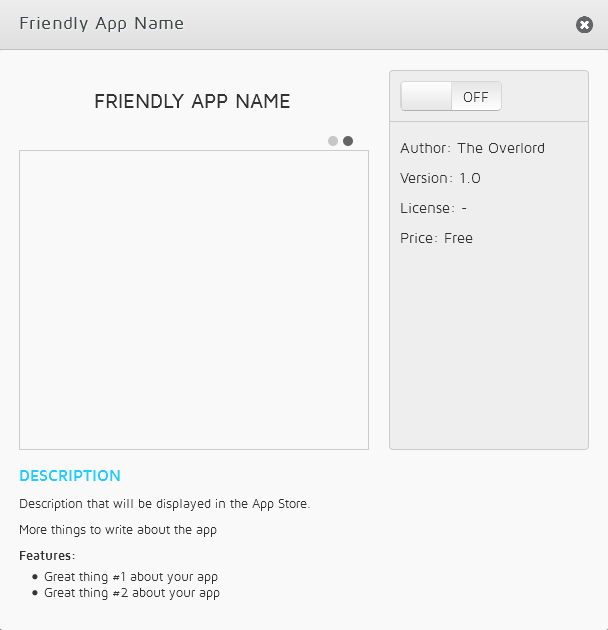 "Great thing #2 about your app"
So let's go through those different attributes: * name: define the name of your app in there. It needs to match the name of the folder of your app, * api_url: define the URL of the Kazoo API to request, * source_url: this defines where the Monster-UI framework will try to get the sources of your app. For now this needs to be hosted on the same server as the Monster-UI, * i18n: In this, you can define the descriptions and features of your app in different languages, to try to reach as many users as possible. The language displayed in the app store will depend on the active setting of the user himself, * tags: There is currently 3 different tags in the Monster-UI: reseller, carrier, developer. You can define all of them if you want your app to be listed in all those sections, * author: Well.. that would be your name, * version: This is only a label but can help you keep track of the different versions of your application, * license: You can specify the license here, * price: This is only a text for now, we plan to be able to charge for certain applications, but it hasn't been implemented yet, so you should leave this value to 0, * icon: This is the name of an image for the Icon of your app, we'll be able to upload this image once this document is created via Futon, * screenshots: This is an array of image names that will be shown in the slideshow of your app page. Now you only need to upload your images, make sure that the names match whatever you typed in the app document. Once it's done, it will magically appear in the Monster-UI app store. Congratulations, you just added an application to the app store! Please let us know if you have any issue with the process, or if you feel like this documentation could be better in any way!